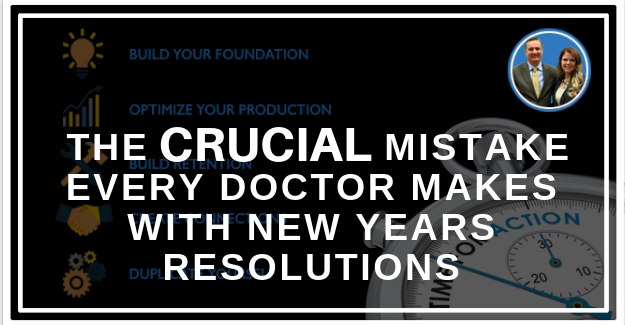 Goals with a new year can quickly add up and overwhelm doctors and staff both. With the new year it is time to assess what you are doing and what you can eliminate from your busy schedule and delegate to those around you to create an atmosphere where people can thrive and make the best of their time at the office. Listen into Dr. John and Wendy discuss the value of taking things OFF of your plate and doing more of what you enjoy! Welcome, everybody, to this episode of the Double Your Production Podcast. I’m John Meis and with me is the amazing Wendy Briggs. Hey, Wendy. Hey, Dr. John, how are you this morning? I am doing terrific. I’m so excited, we’re now just crossing the New Year and– we’re a few days into it and I’ve heard people talking already about how their New Year’s resolutions are down the tubes already. And so, this time of year I always like to think about a different New Year’s concept that I think is really helpful for people, and the concept is not New Year’s resolutions, it’s New Year’s dissolutions. So it is what things are we going to get rid of? Most of the affected people I know, and the people who are listening to this podcast certainly are in that category, are full. They’ve got so many things going, they’re too busy, they’re too scattered, they’ve got too many projects in the works, and they can’t get everything done, and they feel overwhelmed by it and confused by it. And then something comes along that seems to be the fix for everything, that bright shiny object and they just add more and more to their plate. And as they do that, they become less and less effective. So the concept of New Year’s dissolutions is, what am I going to give up? What am I going to stop doing? What have I been doing in the past that maybe hasn’t had the result I expected or maybe has– is now something that my team is capable enough to delegate it to them? What am I going to change and stop doing? It’s kind of a difficult concept. So, Wendy, how about you? Have you thought about this before? I love this approach because I think about it every time I sit down and look at my to do list, right? But I don’t ever take action. I was joking this morning– here we are, what’s the date, January 7th? January 8th? And my Christmas tree is still up in the background, so I was laughing about that this morning thinking, “Well, gosh, there are probably those people that have that cleared out, put away before January 1st.” And because of how life operates, things like that take a back seat, and so I can probably relate with this topic and I’d love to hear some of your thoughts on it. And I can also say that a lot of the dentists that we visit with are absolutely in that boat. You know there’s always one other thing that needs to be done that requires their attention, and then they end up exhausted, completely drained of mental energy before they’re drained of physical energy because of all these decisions and things that are weighing on them heavily. And for you and I, Wendy, we travel an awful lot. Our days are scheduled– and when we travel, they’re usually scheduled from the minute we wake up until the minute we go to bed. But even when we’re at home our days are really highly, highly scheduled just like a dentist’s would be. We have in some ways some greater flexibility, but in some ways not so much. So, when I look at some of the things that as I look at last year and what I want to change about this year, one of those things is having more free time more time to goof around, more time to do hobbies, more time to just be with friends and family. And so I start looking at things that I think of as work and things that I want to get rid of that I think of as work. Now, not everybody would maybe think of some of these things as work, but I don’t particularly enjoy them. They don’t add a whole lot of value to my life and they’re easily gotten rid of. So I’m going to give you an example of that. So I no longer do laundry, I no longer do grocery shopping, and I no longer do just about any cleaning. And so my wife, Kelly, and I, we hired a person. She comes in every Monday, she cleans the entire house, she gets the weeks worths of groceries, she does the laundry, and she’ll do whatever errands we want. So she took the cars to get them washed, she dropped some stuff off at the post office that needed dropped off. I just create a list during the week of things that I want her to do and we hire her for the day, she comes in and she does everything. And so for me, I had to give those, in order to get what I wanted– I could’ve had the New Year’s resolution of having more free time but unless I was willing to give something up it wouldn’t have happened. Right. I mean, that’s so interesting. And so many people hold on to things like that because they feel like, at least for me, that’s part of my job description, right. I’m the mother. That’s part of maintaining and running your home. 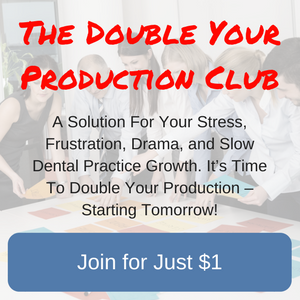 You feel like a failure if you aren’t able to keep up with some of those things and I think we see the same thing on the business side and the dentistry side, especially dentists that are just starting out. They feel like their financial resources– they may be cash strapped. And so they feel like they have to do everything, pay the bills, do the ordering, all of those mundane tasks that are very easy to delegate. And there come’s a point where they continue doing those things because that’s the way it’s always been done or because they don’t have the confidence to let go of some of those things. And so that ends up hurting their own productive capacity in the long run, right. Yep.But I look at it very similar. It is. It’s exactly the same. So we have a member that still does his own bookkeeping. And super productive doctor, really great practice, and doing wonderful things, but he’s got this thing– and the thing that trips him up is that, “It doesn’t take that long for me to do it.” Yeah, it doesn’t take that long for you to do it, but you’ve got that and you probably have seven other things that you’re doing that you don’t need to do. And they don’t take that long to do but if you weren’t doing them, you would have that time to do something that provides more value. So maybe you’re saving an hour and a half a week by not doing those things. Well, what could you do with that hour and a half a week? You could treat patients, for one thing. Be a whole lot more effective then, and provide much more value, and ultimately, I guess, provide more income if you were to do it that way. So really thinking about where it is that you add value and what it is that you enjoy, and getting rid of some of those things that you don’t. So important. And, again, this is on the personal like because it bleeds into the professional life. But especially when it comes to the practice. We see a lot of dentists doing things every day that they don’t enjoy. You do such a great job teaching the quadrants of doing and how they really need to think about everything that they’re doing through the day and where it fits into the things that they enjoy, things that they don’t enjoy but are good at. You could probably talk to the four quadrants of doing and how people are able to start figuring out what to eliminate. That’s probably, I think, where people get stuck is where do they even begin to figure out what to eliminate. Yeah. No. I think that’s a good thing to throw in here. So the quadrants of doing is really a four-box matrix. One axis is things you’re good at and on the other axis is things that you enjoy. And so one of the four boxes is those things you don’t enjoy and you’re not good at. Well, those are easy to give away. I mean, those are pretty easy to get rid of. It’s the two other boxes that are– and the things that you’re good at and enjoy, those are easy to keep. It’s the other two boxes that are kind of tough. And so those are the things that you’re not good at that you enjoy, and I generally consider those to be hobbies. I enjoy photography, for instance. But I’m not going to go out and try to make a living as a photographer. I take some nice pictures, but there’s no way I’m going to make a living doing that. But something that I want to keep because I enjoy it. On the other end is something that you’re good at and you don’t enjoy. That is the box that’s very fruitful. That’s the part of the matrix that’s very, very fruitful for things to get rid of in your new year’s dissolutions. Yup. So in your office, these dissolutions– it’s kind of a team effort. Right? So you’re going to throw this out to the entire team and you’re going to say, “All right. I want to start doing this so I have to give up something. What’s something I’m doing right now that I don’t need to?” And generally, the team will have lots of ideas of things that we either aren’t doing well or they know that we don’t enjoy it, or that we put it off. We procrastinate. And so the team is super helpful in identifying how we can become more effective. Yeah. Such good insights there. So what are some of the dissolutions on your list, Dr. John? I mean, as you look at big year, what are some dissolutions that you think we often see on dentists’ lists? Yeah. So for dentists, some of the things to give up, generally, there are some activities that it’s time up. And sometimes, there are people that it’s time to give up. So on activities, some of the things that have been on my dissolution list in the past, I used to do all of my own scheduling. Well, I found that I wasn’t very good at it and I ended up being double-booked here and there. And so my assistant, [Crista? ], does my scheduling. She also does all my travel. And so those are two things that I didn’t enjoy, I wasn’t particularly good at, and now I have someone that does all those things for me, and she’s so good at it that it didn’t make any sense for me to continue to do it. Another thing is the dissolution of people. And this one is a little harder. It’s a little harder to talk about about even. But most people have somebody in their life that doesn’t bring them joy, that doesn’t bring them value, that might be critical or might be a downer. And those people affect the quality of your life. And so, over time, I’ve looked at the people around me and gotten much more picky about who I spend my time with. Are they fun? Are they interesting? Do they make me a better me? Do you they enlighten me in ways? If I say no to those, I’m going to spend less time with those people. Not necessarily cut them out completely, but going to spend less time with them in order to have more time to be with the people who inspire me. And that point you just made, we see time and time and time again in dentistry with team members that are held on to that really aren’t adding enough value. And how many times have we heard doctors say, “Oh my gosh. I was so afraid of making this change. And once I did, everything got so much better.” Those same principles also apply in the people that you are having support you, that you have to work with every single day. There’s no doubt about it. And it’s the hardest thing to do. We care about the people that we work with. We really think long and hard about what’s best for them in trying to create a bigger future for them. And when it isn’t working, it’s really painful. It’s hard to make those decisions. But often, when you make those decisions, there’s an immediate burst of energy. First of all, you find out all the things that weren’t going the way they’re supposed to be that you didn’t even know about. As somebody takes up that role, and the ones that are doing a great job are completely energized when the ones who are not doing their jobs well are gone. They’re completely energized because now they don’t have to deal with the trouble and the turbulence that’s caused by the person not doing well. And there’s less time spent cleaning up the messes, more time spent making progress. So true. So true. So everyone who’s listening. I hope you can think about yourselves and look at your New Year’s resolutions and your goals and say, “All right. If I want to reach these, I’ve got to give some things up. So what are the things I want to give up.” Some easy ones are watching TV. Easy ones are time with hobbies that’s excessive. I met a young dentist recently who loves to play video games. Well, that’s great. He spends a couple of hours a day playing video games, which is just stunning to me to have a couple of hours a day to do something like that. But that’s a good example of a hobby that you spend some time on, great. But to spend an excessive amount of time on anything like that, it just doesn’t make sense. We see some that are– seems to be overboard on social media, hours a day on social media that really doesn’t necessarily provide value. And I think we’re all guilty of that a little bit. Having the phone in our pocket is easy to just pick it up and lose track of time in that regard. So there’s a lot of things like that as well. 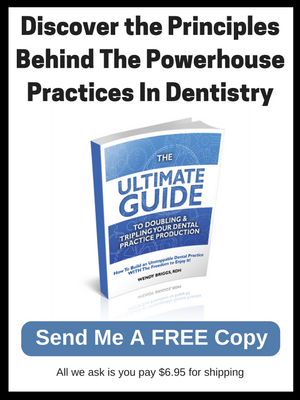 I will tell you another thing that we hear from dentists and their teams is– and this one’s maybe a little bit of a sore spot for some people, but also being more selective with the meetings that they choose to attend. I had a dentistry chap that said, “Hey. I’ve gone to this same meeting for the last 12 years. And it’s kind of been our thing. But I’m really not seeing the return on investment with time that I’d like to get. And so he was asking what suggestions we have, which meetings we feel are valuable. And so this is where we kind of convert a little bit into the shameless [inaudible] of events that we have coming up. We can help them have a bigger future this year that I think it’s important to talk about. Because we do hear from dentists all the time that find themselves stuck and they don’t know how to move forward. So I think it’s worth talking about, that may be something that as you’re looking at your plans for this year, or resolutions, or dissolutions, are you putting yourself then your team in position? Are they surrounded by other successful dental practices that they can actually make good progress, and learn from, and have a high level of value. That’s obviously what we’re trying to build with the meetings that we hold. Sure. So as people look at the meetings they have, typically they will have these different topics that they want to– that they want to improve their skills in. And so on that list should be management, and leadership, and clinical flow. Things that are not traditionally taught in clinical con-ed courses. And so to have a source for that is important. So you really have to be thoughtful about what type of meeting like that is. The other thing is if you have difficulty when you have something you want to implement, you want to get your team on board with it, those kind of meetings are even more important. And we’ve found that when we bring our team to a meeting, when the team or the key people of the team are there and we’re making decisions about what we learned and what we’re going to implement. If we do that as a team, it’s so much easier. it’s so much easier than if I just did it myself and came back and try to convince the team. We just had a team meeting this morning. And one of the team members and I were at a conference and we were trying to describe to you, and the other team member, well, here’s the principle– we weren’t very eloquent at explaining it. But if we had all been there together, everybody would’ve got it and everybody would’ve agreed with it. So that’s a great example of how having everybody together. So one of our events that is designed to do that, to get team members on board is our annual summit. So that’s coming up in here in April. So a couple things that we’ll have on the homepage for the podcast. I think it’ll be great to provide a graphic of the four quadrants of doing Dr. John’s. So let’s go ahead and include a PDF that they can download, that shows that image so that they can kind of visualize what it is that you’re talking through. So let’s also post the information about our summit. Because as you mentioned, that is one event per year. We have a variety of events. 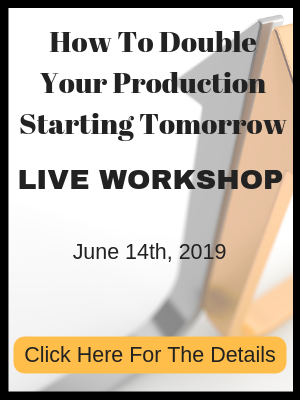 We have a one-day double year production where we really dive into how practices optimize opportunity the practice every single day. We have a handful of those that we do throughout the year. We have our high-level member, they attend our blue diamond practice growth retreat. And that is designed to help propel them forward on a consistent bass. The summit is really our key event as you mentioned, that’s designed to create team cohesiveness. And we have [inaudible] all over the country. They bring everybody on their team. We’ve had people rent a party bus and drive so they can bring all 28 team members to this event/ Because when we look at dental events, traditional continuing education in dentistry, like you said, they may be clinically focused, they may have a varity of different things. Our summit is built with a design to get the team driving the practice forward together. And so let’s go ahead and put that information for our podcast listener so they can get information about that. We also try to make it affordable enough so the dentist can bring everybody on their team. So really, really great topic this year as well. It’s in Orlando, Florida. For those that are interested for more information. Well, we sure to catch that as well. Awesome. Well, great. Dr. John, you’ve inspired me. I’m going to go make a list of everything I don’t want to keep doing this year. and on next to the resolution to make sure we can accomplish all of that. There you go. Sounds good. All right. Well, thanks Wendy for being on the podcast today. Thanks, everybody, for listening to the Double Your Production podcast. And we hope to see you at one of our events soon. And until next time, goodbye.